The architect’s rendering of the new dorm, center. Construction on the upcoming residence hall in Boylston Place will start this summer, but the existing structure won't get any taller until late in the winter or early next spring, according to Jay Phillips, associate vice president for facilities and campus services. Demolition of the site—which previously housed Sweetwater Tavern and the nightclub The Estate—will start after this semester ends, according to Phillips. Emerson plans to spend this summer and fall knocking down the current buildings and laying the foundation. Phillips said that this will require putting in concrete slabs called “piles,” which will support the sides of the dorm so that it can reach its final 18-story height. “Once the foundation’s poured, the building will come up pretty quickly,” Phillips said. The project is still on track to be finished by August 2017, he said. Emerson bought the 1-3 Boylston Place properties in 2010 for $6.5 million. Emerson is currently analyzing the contents of the existing structure, Phillips said, including searching for hazardous materials like lead, mercury, and asbestos. “There aren’t a lot in this building, but we have to know how to get rid of them,” Phillips said. The architect’s rendering of the new dorm, center, as seen from Boston Common. Via the Boston Redevelopment Authority. The college will begin major work on the project after the Boston Water and Sewage Commission finishes its work in Boylston Place, according to Margaret Ings, associate vice president for government and community relations. BWSC is excavating and replacing a water main, valves, and hydrants in the alley, according to its website. Phillips said that the current work in the alley has nothing to do with Emerson’s new residence hall project. “It’s just coincidental that they would take place at the same time,” he said. 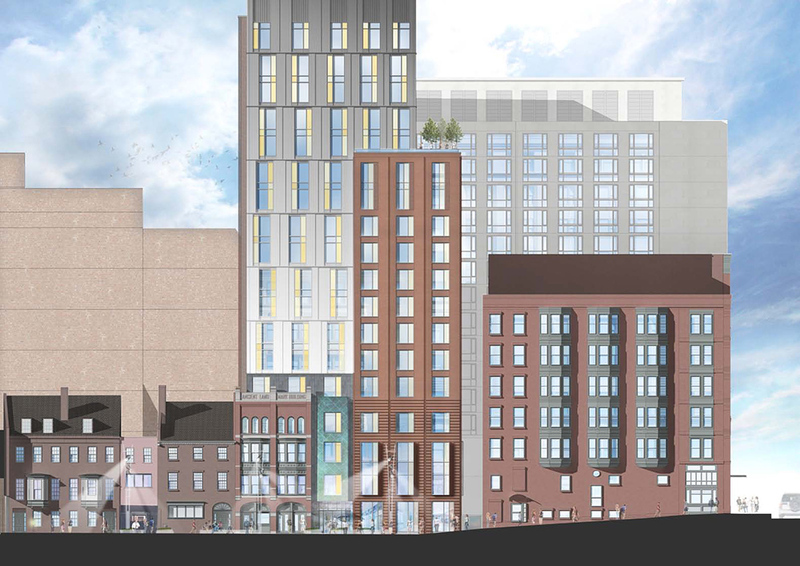 The Boylston Place dorm project is finished with its city approval processes, but Ings said that the college still meets regularly with the Boylston Place Association, a group of property owners in the alley, and all of the property owners adjacent to the site. Phillips said that the adjacent properties are physically connected to the future dorm in some places, so Emerson has to be attentive to the neighboring buildings. Phillips said that construction noise between 7 a.m. and 6 p.m. will stay under 70 decibels—roughly equivalent to a dishwasher or vacuum cleaner—which is in accordance with city regulations. Phillips said that crews will be allowed to work past 6 p.m. with permission from the city, which Emerson usually requests for projects on campus. The noise levels in the evening would still be lower than during the day, he said. 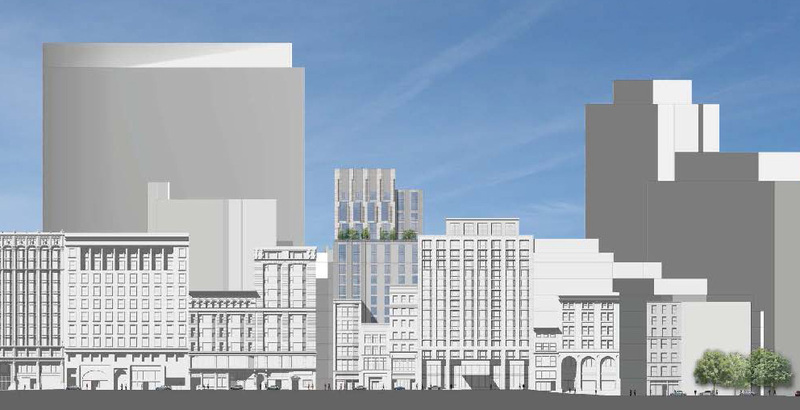 Phillips said that the college hasn’t yet done anything for the Boylston Place project that would generate noise. The college intends to create a document, to be updated daily, that will list Emerson’s planned construction activity for the next two weeks, said Phillips. This will be distributed via email to interested parties and neighbors. Phillips said he plans on working with the Office of Communications and Marketing to post the schedule on Emerson’s website. There have been no changes to the design of the building since it was approved, according to Phillips.